The Jewish contingent in this year’s Vancouver Pride celebration is inviting everyone to participate. Yad b’Yad, the Jewish LGBTQ organization, will have a booth at the festival site on Sunset Beach, from 9 a.m. until 5 p.m. on Sunday, Aug. 2. The parade runs from noon until 3 p.m., culminating at the Sunset Beach site. Jonathan Lerner, who is coordinating Yad b’Yad’s participation, said the decision was made to participate as a booth rather than to march in the parade, as the community has done beginning in 2010. Yad b’Yad will be giving away items, offering face painting, a spinning wheel with prizes and an educational component, he said. The presence of the group on Pride day has a dual purpose, he added. Yad b’Yad is Hebrew for hand in hand, which is meant to symbolize the two communities working together and the two identities that many people have, Lerner said. Yad b’Yad is just about a year old and represents a solidification of the community’s approach to LGBTQ issues, which until now was more ad hoc. 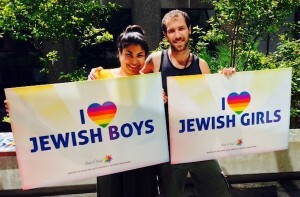 The community’s first participation in the Pride parade, in 2010, was spearheaded by Hillel BC, with support from the Jewish Federation of Greater Vancouver and other community groups, including synagogues. Lerner, who is director of operations, administration and finance for Hillel BC, explained Yad b’Yad’s mandate. “We started out to provide resources to queer members of the Jewish community and to advocate for the Jewish community within the LGBTQ community, because we still see a lot of antisemitism within that community,” he said. “Once we established the group, Yad b’Yad, it was a decision among the organizations that had been involved before – including Federation, CIJA [Centre for Israel and Jewish Affairs], Hillel – that Yad b’Yad as a group should sort of lead the charge” in organizing Pride day events. Potential volunteers, or anyone seeking additional information, can email [email protected].